Whew! It was a crazy weekend in Houston, but not so much for us. We were party poopers and stayed close to home simply because we were afraid that if we left we might not make it back home. However, I did capture a cool super bowl picture for you. This is the fly-by that took place during the national anthem. I ran out of the house like a mad woman onto the landing outside to catch this. 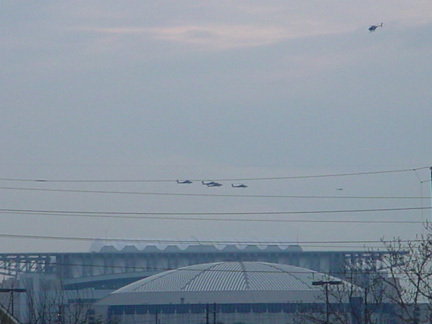 What you don’t see on tv is the extra helicopter there, I’m guessing, to film the moment. Otherwise, we went to look at our house in progress and stayed home. I started on a baby blanket for my husband’s friend from work but quickly abandoned it. I didn’t know if I had enough yarn and I knew I didn’t have the time to complete it by this weekend. So, it’s back to the ribby shell. I’m going to buy something for the baby and maybe make a little hat in our school colors (we all went to the same college) to match. I did some homework and started packing for our upcoming move. Well, today I woke up on the wrong side of the bed and have been cranky all day (which rarely happens, I’m usually quite positive). So, tonight, I’m going to snuggle up on the couch with my ribby shell and call it a night to put me in a better mood. The house looks awesome!! How exciting! I really like the action shot of the helicopters. When are you guys moving?